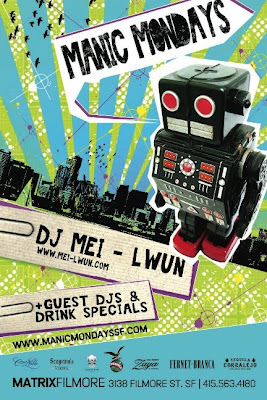 Tonight is one on my personal favorite new djs on the SF Scene HellaMiles. This youngster is possessed on the decks and comes through with fresh cuts like a butcher. Resident and host DJ Mei-Lwun in the hizzle w/HM serial killing the crowd @ MANIC MONDAYS for his sequel appearance YOU... be there early. Its gonna be a thriller. Fernet and Coralejos on special.